I saw this cookie press over the summer, and just couldn’t resist. These finished shortbread rounds, despite being a very crumbly dough, come out moist and wonderful. I am partial to cardamom, but you can tweak them with whatever add-ins your clockwork hearts desire. Tasty, flaky, they’re ideal with a tall glass of cold milk, or a cuppa. My press came from Wandering Wood, a merchant within the SCA. If you’d like to contact them to order your own fabulous press (they do custom work! ), you can find them here. Mix all ingredients, wrap in plastic, and chill for at least 30 minutes. Roll out the chilled dough to 1/2″ thick. 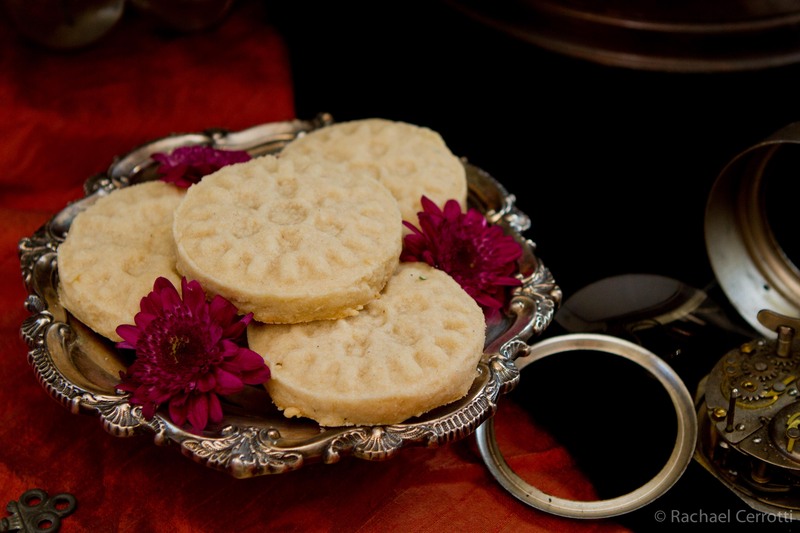 Using a 3″ round cutter and a cookie stamp, punch out discs of shortbread. Or, if the dough is too crumbly, you can press it into cookie cutter shapes. Carefully transfer the shortbread to a parchment-lined baking sheet. Bake at 325F for 10-15 minutes. The shortbread should be pale in color. Allow to cool on the baking sheet for a few minutes, then remove to a cooling rack.